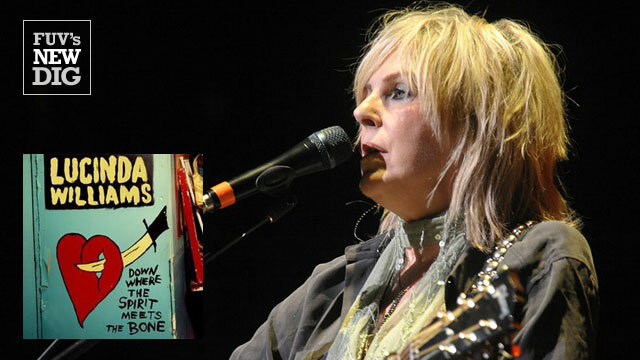 Lucinda Williams fans can rejoice. Her new album, Down Where The Spirit Meets The Bone, is a 20-song, 100-minute Lucinda-bonanza, spread over two discs. The new collection, a follow-up to 2011's Blessed, is the result of a fertile period of creativity that netted enough material for three albums. The impetus for this artistic binge came from opportunities presented to Williams to write songs for a variety of different projects. Once she was locked into this creative zone, there was no stopping her. In addition, she herself has said that growing older and wiser has naturally increased her productivity. Down Where The Spirit Meets The Bone is the first album Williams has made for her own label, Highway 20 Records, which allowed her to work freely, without restrictions. This liberation not only resulted in the unusual length of the work, it provided the opportunity to let individual songs spread out and breathe. A number of the tunes benefit from being able to fully develop: When necessary, arrangements take their time, and guitar passages and solos stretch out to their natural conclusions. Spirit begins with "Compassion," an acoustic song adapted from a poem written by Lucinda's father, Miller Williams; it's where the album gets its name. What follows is a long line of finely crafted, rootsy country-rock songs; the kind that she is best known for. And the album feels stronger as it progresses, with many highlights delivered in the final quarter. The proceedings come to a close with a nearly 10-minute take on J.J. Cale's "Magnolia." Assisting Williams on this ambitious undertaking was her manager/husband Tom Overby, who produced Spirit with Lucinda and Greg Leisz. Drummer Pete Thomas, guitarists Bill Frisell, Tony Joe White and Jonathan Wilson, and keyboardist Ian McLagan (from Faces) are among the fine musicians who play on the album. Jakob Dylan also makes an appearance to sing some harmonies. The building blocks for Williams' next album are already in place, laid down during the Spirit sessions. Reportedly it will include the prominent presence of guitarist Bill Frisell, and a 15-minute version of Mississippi Fred McDowell's "Saving Grace." That's just like Lucinda, to keep us looking ahead.